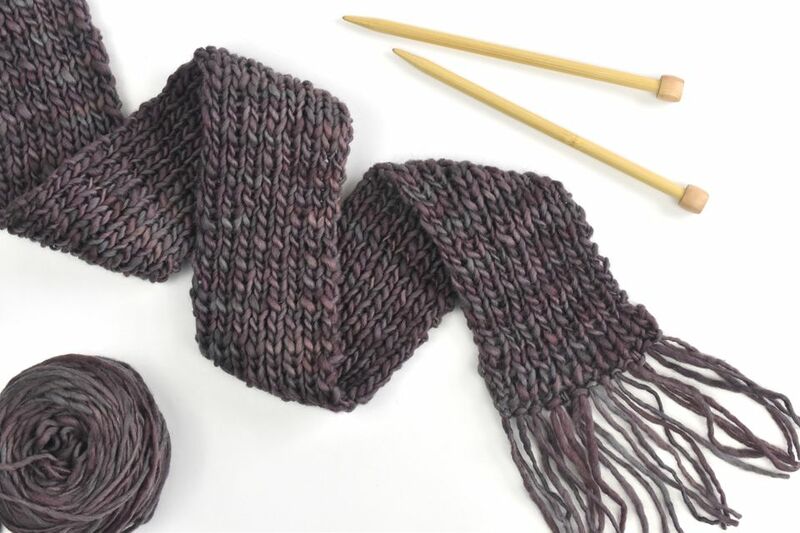 A bulky ribbed scarf is a great way to use some of the bulky yarn in your stash that you might not know what to do with. This type of scarf knits up fast, so you'll have a completed project in no time. Plus, it will keep you warm on even the coldest days. You can add a fringe if you like or leave it off and knit the scarf longer. If you have several colors of matching yarn, you can even add stripes to your scarf! Whether you're knitting for yourself or as a gift for a friend or family member, this pattern is fun for men, women, and children. A Note About Yarn: For this project, you can play around a bit with yarn weight and needle size for different results. The yarn shown in the sample scarf is Manos del Uruguay Wool Clasica in Oilslick. This yarn is an aran weight yarn because some sections are thin like DK yarn and others are thick like a bulky weight, but overall it's closer to a bulky yarn. A good substitute would be Patons Alpaca Blend Yarn. Gauge is not critical for this project. To match the gauge of the sample, you should have 16 stitches and 13 rows per four inches in ribbing. The finished scarf is four inches wide and about 60 inches long, plus fringe. A great scarf could not be easier to make. The bulky yarn used here is easy to work with and the stitch pattern simply requires a repeat of knit one, purl one. It's a great project for beginners or any knitter who wants a mindless pattern to work on while watching TV or working in a knitting circle. Start by saving about 10 yards of yarn for the fringe. By cutting this piece off now, you can knit your scarf until you run out of yarn, and not have to worry about stopping too early or too late. Set the fringe yarn aside. Now you can start on the scarf. Work in knit 1, purl 1 ribbing until you run out of yarn or the scarf reaches the length of your choice. Bind off in the pattern. Weave in any remaining yarn ends. Fringe is a nice way to finish off many scarf patterns, especially simple designs like those used in this ribbing. It's very easy to do and a skill that you can use throughout your knitting career. With the remaining yarn, cut 28 pieces of yarn about 12 inches in length. For each fringe, fold a piece of yarn in half. Use a crochet hook to pull the yarn through the edge of the knitting and pull the ends through the loop. Do this 14 times on each end of the scarf, placing the fringe pieces between the stitches. Garter Stitch Scarf: This is the most basic scarf stitch. The garter stitch is perfect for beginners because all you do is knit without purling. Basket Weave Scarf: Bring a little texture to your gifted scarves with this easy woven pattern. It's just as simple as the ribbed scarf and is great for charitable giving.